“Jesus said to them, ‘I am the bread of life; whoever comes to me shall not hunger, and whoever believes in me shall never thirst’” (Jn. 6:35). 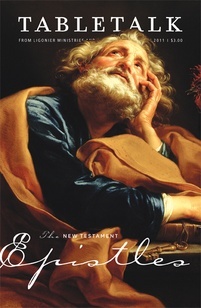 It is no surprise that Paul and the other New Testament authors had such a high Christology — a doctrine of Christ that identifies Him with the one true God — because they merely reflect what Jesus said about Himself. The gospel of John contains our Lord’s most direct affirmations of His divine self-identity, especially in the various “I Am” sayings found in the beloved disciple’s account of the life and ministry of our Savior. So that we might have a greater understanding of what Jesus said about Himself, we will be looking at these “I Am” sayings in John’s gospel for the next few days, using Dr. R.C. Sproul’s series Knowing Christ as our guide. The first “I Am” saying of Jesus recorded in the fourth gospel is “I am the bread of life” in John 6:35. First of all, let us note that there is a significance to the Greek construction that is translated “I am.” This construction, egō eimi, is used in the New Testament to place emphasis on the subject — the “I” of the above saying. The meaning is seen more clearly if we translate egō eimi as “I, I myself, am,” and though it is a rare construction used in the New Testament, it appears in the gospel of John each time Jesus says “I am.” It is the same construction found in the Greek version of Exodus 3:14, where God declares of Himself: “I am who I am.” No first-century Jew would have missed such a clear self-reference from Jesus to His own deity. Additionally, Jesus’ use of “the bread of life” in John 6:35 gives us other information about Him. Just like He gave bread or manna to the Israelites during the exodus, the Father sent Jesus to grant and sustain life. Yet Jesus is far better than the manna of the exodus because Israel’s hunger was satisfied temporarily, but those who partake of Christ will never be hungry again (vv. 35, 40, 47, 54). The Bread of Life grants and sustains eternal life — no one who comes to Christ in faith can ever be cast out (v. 37). We are confident of this because the Father has given to His Son a people who cannot be lost (v. 39), since the Father compels them to put their fate in the hands of Jesus, and He will raise His people from the dead on the last day (vv. 39, 44, 54). We also see the purpose for Jesus’ coming in this statement. Christ came down from heaven to grant and sustain eternal life, and Jesus accomplishes this feat through His redemptive death whereby He gives His life for the world (v. 51). The first time we feed on Christ by faith, putting our trust in Him alone for salvation, we are brought out of the kingdom of darkness into the light. We are sustained in the faith that saves us as we continue to feed on the Savior, learning from Him as we read God’s Word and hear it preached, and as we experience His presence among His people through the sacraments. If we regularly taste and savor Jesus, we can be assured of our salvation.